Liverpool career stats for Robbie Fowler - LFChistory - Stats galore for Liverpool FC! Robert Bernard Fowler is born and raised in Toxteth in Liverpool, an area where unemployment was rife. Fowler was an Everton supporter in his childhood and loathed Ian Rush's achievements with Liverpool especially since Rushie was very prolific against Everton. Fowler was chosen to play for the u-14 team in his school where he was spotted by Jim Aspinall, Liverpool scout. "He knew when and where to put the ball away, and run into space," Aspinall said. "He had such a lovely touch on the ball." Fowler got his first taste of the first team at the end of the 1992/93 season when he was twice on the bench; against Bolton in the FA Cup and in the final League match when Liverpool beat Tottenham 6-2. He scored in his first match for Liverpool against Fulham in a 3-1 victory in the League Cup on 22 September 1993 and in the second leg against the Cottagers he scored all five in a 5-0 win! Fowler was only the fifth player in Liverpool's history to achieve that feat. Fowler scored his first hat-trick against Southampton in only his fifth League match and no less than 13 goals in his first 15 games for Liverpool. It was pretty obvious that Liverpool's number 23 was a goalscoring phenomenon! A broken ankle in the FA Cup against Bristol City on 19 January sidelined Fowler until the beginning of March and he only scored three goals in his remaining 11 games, but had nevertheless scored one less goal than Ian Rush, 18 in total, but Rush had played 15 more gam,es than he had! Fowler started the 1994/95 season by scoring five goals in the first three games including an incredible Anfield hat-trick against Arsenal in only four minutes and 33 seconds which is still a Premier League record! Roy Evans, who by now had succeeded Souness as boss, was ecstatic with his young genius: "Robbie has immense talent. He can be frightening," Fowler played an important role in beating Crystal Palace in the semi-finals of the League Cup by scoring the winner in both legs. He started up front as Liverpool beat Bolton 2-1 in the final. Fowler's best friend, Steve McManaman, was outstanding on the day and scored both goals for the club. Fowler got a nice birthday present when he was chosen the Young Player of the Year in the Premier League. He was also the only player who had featured in all of Liverpool's games that season and the team's top-scorer with 25 League goals in 42 matches, all in all 31 goals. Fowler had dyed his hair peroxide blond at the start of the 1995/96 season. He had also a new partner up front, Stan Collymore. But in the first two League games Evans used Rush and Collymore and the top-scorer from last season had to settle for being a substitute. Collymore got injured and Fowler was back in again. Fowler was slow out of the blocks but came into his own with a quadruple against Bolton on 23 September 1995. Fowler was surely one of the most in-form strikers in Europe and scored two memorable goals at Old Trafford on 1 October 1995. The spotlight was on the infamous Eric Cantona who was returning from an eight-month absence after his misadventures at Selhurst Park. Fowler's equaliser was struck with such incredible venom from the edge of the box that Schmeichel never saw the ball. He scored a hat-trick for the second season in a row against Arsenal on 23 December and in the beginning of March scored two of Liverpool's three goals in the opening eight minutes against Aston Villa and at the end of the month Villa faced his wrath again when Liverpool beat them 3-0 in the FA Cup semi-finals. A tremendous occasion to showcase his talents awaited at Wembley in an FA Cup final against Manchester United. To put it short, the game was terribly disappointing, ending in an 1-0 defeat. Yet another great season for Fowler was at an end. He was again chosen the Young Player of the Year, becoming the second player in history to achieve that honor. Fowler played his first senior international when he came on against Bulgaria on 27 March 1996 and was included in Terry Venables' England team in Euro '96 on home soil that summer. Venables preferred Shearer and Sheringham up front so Fowler was third-choice striker. He finally made an appearance in England's third game of the tournament and one of the best England internationals ever when Holland were beaten 4-1. Sheringham, who had scored two goals, was substituted for Fowler 15 minutes from time. Fowler also made a substitute appearance against Spain in the quarter-finals in the 110th minute. England survived the penalty shoot-out but unfortunately for England, Germany beat them on penalties in the semi-finals. Rush was now gone and Fowler inherited his number 9 shirt at the start of the 1996/97 season. Fowler had a back injury and only scored two goals in his first eight matches. Collymore wasn't scoring much either, but there was a new kid on the block who kept the worries away for Evans. Patrik Berger scored two goals against Leicester and another double in a 5-1 victory over Chelsea. Fowler was out injured for three matches but following his return he scored 17 goals in his next 15 matches including four goals against Middlesbrough on 17 December 1996. His second goal in that match was his hundredth for Liverpool in 165 games, achieved in one game less than by Ian Rush. It is said that lightning never strikes twice, but it did happen in the match against Newcastle at Anfield on 10 March. Another 4-3 victory was a fact and this time it was Fowler who scored the winning goal in the last seconds. He owned all the headlines in March. He got rave reviews from UEFA's chairman Sepp Blatter for trying to prevent a penalty against Arsenal which the referee gave Liverpool after Seaman had been judged to take Fowler down. Fowler dived and admitted it as soon as he got up. He took the penalty himself and missed but McAteer followed up to score. But his love affair with the UEFA didn't last long. Two days later Fowler was fined for his support for the dockers at Albert Docks who had lost their jobs, by wearing a t-shirt telling people to support the 500 sacked dockers, in a match against Brann from Bergen. He was back in the headlines in April when his season was suddenly cut short. In a moment of madness he was sent off in the Merseyside derby when he clashed with David Unsworth. Fowler scored his last goal of the season in the 2-0 victory against Paris St Germain when the Reds crashed out of Europe and was suspended for the last three games of the season. Ligament damage in Fowler's right knee received against a Norwegian XI in Oslo on 31 July 1997 kept him out for the first six matches of the 1997/98 season. Michael Owen was now the focus of attention, after getting his chance at the end of the previous season due to Fowler's ban. They finally played together for the first time against Aston Villa on 22 September at Anfield after Fowler had replaced Owen after an hour's play in the previous game. Fowler's temperament was back in question against Bolton on 1 November. He scored after only 48 seconds but in the seventy-fifth minute he elbowed Per Frandsen and was sent off. On Boxing day Fowler scored two goals in as many minutes against Leeds in a 3-1 victory and netted two in seven matches in January, both in the League Cup. Thirteen goals in 23 games was Fowler's record when he scored his last goal of the season on 27 January. He had gone four games without a goal when on 23 February a catastrophic collision with Everton's goalkeeper Thomas Myhre five minutes from time resulted in torn cruciate knee ligaments which kept him out of action for the next seven months. Roy Evans resigned in November 1998 and Houllier was sole manager with Phil Thompson as his assistant. First game under their management was against Leeds at Anfield. Fowler scored the only goal for Liverpool from a penalty but Leeds ran out 3-1 winners. But Fowler shone bright in the following match when he ran Villa ragged, not for the first time in his career. A brilliant hat-trick signalled his intentions. Houllier was happy: "It's difficult to say if Robbie is back to his best but that was certainly an important reference game for him. He went through a mental barrier and he now knows he can do it again." Fowler was still struggling for consistency not surprising given his lengthy injury and change of management. He had to wait seven matches for his next goal. 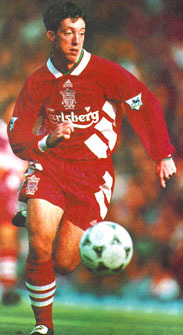 Two matches later on 16 January, Fowler scored his second hat-trick for Houllier in a 7-1 victory against Southampton. Further good news from the Fowler camp followed in January when he signed a new five year-contract with Liverpool. If January was all about the positives, the contrary was looming on the horizon. Two controversial incidents against Chelsea and Everton got Fowler in trouble. On 27 February Fowler decided to follow up rumours about Chelsea's Graeme Le Saux's sexual orientation by turning his backside towards him and shake it about. Le Saux's retribution came swiftly. He poleaxed Fowler from behind. Incredibly enough Fowler got a two-match ban while Le Saux was banned for just one match. On 3 April Fowler "snorted" the line after scoring the first of his two goals in the 3-2 victory over Everton. Fowler said his actions were in response to the "smackhead" taunts he'd endured at Goodison Park last October and on the streets of Liverpool. Fowler received a two-match ban for the Chelsea incident and four for the snorting. Following the Everton game he featured in three matches without scoring and was then forced to sit out the remaining six matches of the campaign. Fowler's controversial behavior on the field inspired rumours Liverpool's manager was unhappy with him and he was on his way. Fowler scored in the first game of the 1999/00 season against Sheffield Wednesday as well as one of the goals of the season on 28 August, a piledriver from 30 yards in off the bar at Anfield. Fowler had felt pain in his ankle before the match against Everton on 27 September but decided to play. Fowler only lasted an hour before being replaced. He underwent an operation and was expected to be out for three months. Fowler made three substitute appearances in December and scored his third goal of the season against Wimbledon on 28 December. He had now scored 150 goals in total for Liverpool: 95 goals were scored with his left, 30 with the right and 25 headers. 127 goals were inside the box including 11 from the penalty spot and 23 outside. His ankle was sore after the Wimbledon game but he wasn't prepared for the earth shattering news that he had to be operated on again. He didn't play for four months until he came on against Everton on 21 April. He made couple of more substitute appearances before being given a chance in the starting line-up in the penultimate game of the season against Southampton. He didn't get on the scoresheet and his brief campaign was effectively finished. Kevin Keegan chose Fowler for his Euro 2000 squad but he didn't make an appearance in the finals. England exited quickly. Fowler was carried off in a 2000/01 pre-season match against Glentoran following a freakish collision with the goalkeeper and was out for six weeks. Fowler scored in his tenth game of the season against Chelsea in the fourth round of the League Cup, a dramatic winner in extra-time. Houllier admitted he was willing to offload Fowler. "All players have their price. Robbie is not on the transfer list, but we look at all our players and assess things when it suits us." These words didn't seem to convey anything at the time but the truth was that Liverpool had accepted a £12million bid from Chelsea in December 2001 but Fowler wanted to stay put. Fowler was in the headlines for all the right reasons when he scored a hat-trick against Stoke in the League Cup, which was his favourite competition, having scored 25 goals in 29 matches. Fowler was the star of the show when he scored a sensational goal against Birmingham in the League Cup final on 25 February which resulted in a penalty shoot-out victory for the Reds. A lob far outside the box ended in the net. Fowler had been in and out of the starting line-up in Liverpool's successful treble season but proved a valuable player in the final run-in. He scored a great free-kick against Wycombe Wanderers in the FA Cup semi-final. He was a substitute in the UEFA Cup final against Alaves but scored Liverpool's fourth goal that almost proved the winner. He only played for the last 13 minutes against Arsenal in the FA Cup final win but Michael Owen scored two goals following Fowler's introduction into the game. Speculation was rife that Fowler was unhappy and didn't get along with Owen. Houllier was fed up: "We have unity in this squad and what has been written about Robbie Fowler is rubbish. The first person to congratulate Michael Owen on Saturday was Robbie. Some of the things I read amaze me. It seems to me people are always trying to stir things every time we have a big game. Everyone can see Robbie was as ecstatic as anyone on Saturday." One crucial match was left of the season against Charlton at The Valley. Fowler was sensational and scored two goals which clinched second place, Liverpool's best-ever Premiership finish and a place in the Champions League. Fowler was happy with the season: "It means a lot to me as a Liverpool lad to be here and I want to remain a part of it. I have never rolled over and died when I have faced a challenge and I’m not going to start now. Some people have said certain things about Liverpool this season. I hope they are eating their words now. Apart from the three cups and third place, we have beaten our two biggest rivals, Manchester United and Everton, twice in the same season, which I am told had never been done before." Fowler got into trouble with Phil Thompson on Melwood in August 2002 when Thompson was in the goal picking up a ball and Fowler hit him with a well-placed shot. Seen as a threat to Thompson's authority Fowler was dropped from the squad facing Manchester United in the Charity Shield. After issuing an apology to Thompson he was back in the first-team fold and scored his first goal of the season against Haka in the second leg of the Champions League qualifier. Fowler started in the defeats against Bolton and Aston Villa, but he was back on the bench for three matches. A true Fowler highlight was a hat-trick against Leicester on 20 October 2001. Fowler had clearly not though been in ideal form. He had only scored four goals in ten starts and seven substitute appearances that season when it was announced on 27 November that Liverpool had agreed to sell Fowler to Leeds. Fowler completed the £11.75million transfer two days later. Roy Evans once famously said he would rather jump in the Mersey than sell Fowler. Houllier was asked why Fowler was sold: "It wasn’t our decision to let him go. Robbie wants to go and to see a local boy moving on is a sad thing for the club. More than most he felt it difficult to fit in with the rotation system. I can understand that he found it hard. Robbie felt that a move at this moment in time would help his career and you have to respect that. He feels the time is right to move on and it was his decision." Again the unthinkable happened in 2006 when Robbie Fowler the prodigal son returned to Liverpool in a sensational move over four years after he had left Merseyside for Leeds. He scored 14 goals in 33 matches over a 14-month period at Leeds before moving to Manchester City where he stayed three years, scoring 27 goals in 92 matches. Five days after re-signing for the Reds, he came on as a substitute for Peter Crouch in a home game with Birmingham City. Liverpool had just taken the lead when he entered the pitch but he was unable to add to the score, although he did have an acrobatic injury-time overhead-kick disallowed for offside. The goals started to come again, five in the League before the end of the season being enough to ensure him an additional year's contract at Rafa's Reds. Fowler scored seven goals during what would turn out to be his final season at Anfield, three penalties against Sheffield United, two against Galatasaray in the Champions League and strikes against Reading and Arsenal in the League Cup. That took his final total for Liverpool up to 183 goals from 369 games. Denied the chance to say a proper farewell to the Anfield public by the sudden move to Leeds in 2001, Robbie and his young family proudly walked around the pitch at the end of the final League game of 2006/07 to say goodbye. On 21 July 2007 Fowler signed for Championship club Cardiff City. His two League Cup goals at West Bromwich Albion in the third round of the competition amazingly led to Cardiff being paired with Liverpool in the next round. He played the whole 90 minutes for Cardiff at Anfield and received a rapturous reception from the home supporters but was unable to prevent his new club going down to a 2-1 defeat. Unfortunately, Fowler's injury jinx was soon to strike again. The recurrence of a hip injury plus damaged ankle ligaments sustained in a training-ground incident with his captain, Darren Purse, meant that his first-team opportunities were limited for the rest of the season and it wasn't a major surprise that he was not fit enough to be considered for a place in Cardiff's FA Cup final squad for the big match against Portsmouth at the new Wembley. Fowler signed a three-month deal with Paul Ince's Blackburn before the 2008/09 season, but only made three starts and three substitute appearances without scoring a goal. He signed a two-year contract with Australian side North Queensland Fury in February 2009. Fowler was said to have dubious motives for his move to Australia but answered his critics by releasing a short statement to the local newspaper in Townsville: "I'm not here for a holiday. I have come here and I want to enjoy my football and I want to play as much as anyone but certain things dictate that sometimes you can't play. I'm prepared to work hard and get on that pitch. I'm not just here to enjoy the sun, it's pride in myself." After just one season with North Queensland Fury, at a time when that club had severe financial problems, Fowler was released from his contract to effectively become a free agent again. Towards the end of April 2010 it was Western Australia club Perth Glory who were able to announce that the 35-year-old Fowler had agreed to become their 'foreign marquee player', which meant that his wages would be excluded from the club's salary cap. The move appeared to suit both the player and his new club well, the Perth Glory Chairman commenting: "It's exciting for football fans in Western Australia that a legend has decided to play for us." At the end of the first week of April 2011 Fowler was commended by Pep Segura for showing a 'great attitude' as he trained with Liverpool's reserve-team squad. Segura, who had taken over from John McMahon on a temporary basis until the end of the 2010/11 season. explained that Fowler wanted to maintain his fitness-levels but added that "his presence can have a significant impact" upon his young side. During April 2011 Robbie also spent a week as part of Bury's backroom staff, about which he said of his managerial ambitions "I know you can't play forever and being a coach or manager is obviously the next step you take after playing. I want to stay involved in football so this is the next route." In July 2011 Fowler made an unexpected move from Australia to Thailand's Muang Thong United. At the start of October 2011 he was made caretaker coach of the Thai club. Early 2012 Fowler quit Thailand and moved back to Liverpool as his wife wanted to go back home but prior to the launch of a new Indian League Fowler was one of a few big-name stars sold at an auction. Fowler went for £338,000 to Kolkata but said himself he wasn't sure if he would play there. In the end nothing came of it. Fowler trained with Blackpool for a while towards the end of the 2011/12 season. Blackpool manager Ian Holloway seemed keen to add him to his squad as the Seasiders attempted to make an immediate return to the Premier League. Fowler was unable to agree personal terms with the club and retired from playing. Fowler re-ignited his association with Liverpool by being part of the club's entourage of their 2012/13 pre-season tour in America. Fowler's genius for goals will never diminish and he can be rightly called the most natural goalscorer who has ever featured for Liverpool. Fowler is a regular in LFC legends games and is a regular pundit for BT Sports. I first bumped into Robbie Fowler in 1998 outside Anfield in rather awkward circumstances.Now 16 years later we met again. Wednesday October 31, 2007 from The Guardian. Andy Hunter at Anfield on October 31, 2007 for The Guardian. Robbie Fowler said goodbye to Liverpool on 13th of May 2007. How important is Fowler to Liverpool's strikeforce? Alex has detailed Fowler's scoring stats to show how his decent scoring record is maintained despite being fourth choice and without the time on the pitch to improve it. The Observer match report on Liverpool - Sheffield United on 24.02.2007. The Telegraph report on Man City - Liverpool on 28.12.2003. The Guardian report on Charlton - Liverpool on 29.05.2001. The Guardian report on Leeds - Liverpool on 27.01.2001. The Telegraph match report on Wigan - Liverpool on 11.02.2006. Liverpool Echo match report on Liverpool - Arsenal on 28.08.1999. Match report from The Sunday Telegraph on Liverpool - Everton on 03.04.1999. Match report from Press Association on Liverpool - Charlton on 19.09.1998. Match report from British Soccer Week on Liverpool - Aston Villa on 08.10.1994. Match report from The Daily Mail on Liverpool - Arsenal on 28.08.1994. Match report from Liverpool - Middlesbrough on 14.12.1996 from Press Association. Match report from The Guardian on WBA - Liverpool on 01.04.2006. Match report from the Guardian on 09.04.2006 from Liverpool - Bolton. Match report from The Guardian on Liverpool - Fulham on 15.03.2006. Happy birthday, Robbie - the new number five! Robbie Fowler’s goal vs West Brom on 1st of April 2006 was his 173rd for the club and made him fifth in the all-time list of Liverpool goalscorers. Robbie Fowler returned to Liverpool in glorious January in 2006. Match report from 13.03.1994 on Liverpool - Everton from British Soccer Week. Match report from 30.10.1993 on Liverpool - Southampton from British Soccer Week. Match report from Fulham - Liverpool on 22.09.1993 from British Soccer Week. Match report from Liverpool - Fulham on 05.10.1993 from British Soccer Week. From the Guardian on 29 June 2009.
International Express report on Liverpool 3 - 1 Chelsea on 9 November 1994. Match report from 23.09.1995 by Mark Thomas of "Press Association"
A few years ago, Roy Evans was at Liverpool's training ground giving a television interview when he was struck on the shoulder by a football. From the press - 25.02.2001. Footballers' Football column in the Daily Mail on 13 September 2013. 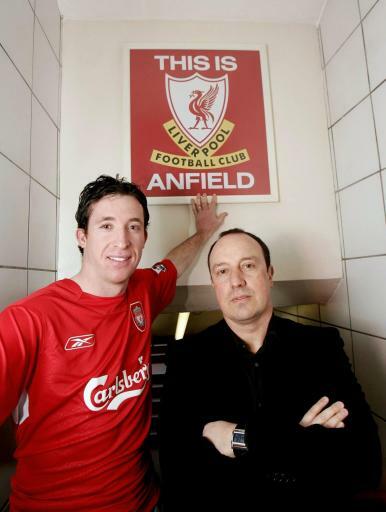 Robbie Fowler talks about the path that lead to LFC. From www.icons.com. Robbie Fowler Q&A session. Previously on www.icons.com. "He's not coming out. He says he wouldn't know what to say." "I was watching my lad playing in goal for Ormskirk schoolboys against Liverpool schoolboys and this little lad knocked in two against him. I asked someone what his name was; 'Robbie Fowler'. From the start he was a fantastic talent." "You do stupid things when you are young and growing up but everyone has to grow out of that. I'm 25 now. I'm not a kid any more. I've got another three years left on my contract. I'm more than happy at Liverpool and my family is happy here." "He is often referred to as God which sums up the respect he commands at Anfield from fans and players alike. But don’t be surprised if he answers to Bernard, which is his other Christian name." "We have signed a player with so much passion for this football club and I think he will act as an example to every player here in how much he loves Liverpool. I'm not sure I've ever seen a player quite so happy to be joining a club before. He hasn't been signed because he loves the club; he's been signed because he's one of the best goalscorers ever to play in the Premiership and he can score goals for us right now. We have signed a player with a passion and a heart for this club that no amount of money can buy. We are close to a very high level right now but with Robbie we can go even higher." "It is unbelievable, a dream come true. I can hardly believe that I am back and it's an incredible feeling. After I'd signed I sat in my car outside Anfield and was incredibly emotional. I know the odds: I have come back on a short-term deal and, after that, it is up to me. I hope I will get the chance to play and, if I do, I will take that chance. I don't see this as the end of my career. I am hungry, as hungry as I have ever been, and I want to show that to everyone. I fully intend to prove that I am worth a new contract." 'It was just a joke. The Metz players would get down behind each other and pretend to eat the grass. Rigobert, who used to play for them, did it in training and we all had a laugh. Robbie did this in front of the Everton fans, but if the goal had been scored at the other end, he would have done it there. It was just a goal ceremony. It had nothing to do with drugs. At the moment, everything he does seems to be open to interpretation. When your heart is racing, maybe you don't think of the circumstances. We had a laugh about in in the dressing room. Robbie has been surprised by the reaction to this." "I've never known a transfer happen quite so quickly, it was all done within 24 hours. I had to persuade Robbie to look at the contract. I think I could have put a contract in front of him with no money on it and he'd have signed it! He really was that desperate to come back." "I leave it in good hands; Robbie will probably eclipse all that I have achieved at Liverpool." "He often shoots early, he doesn't mind where he shoots from, but he seems to get late fade on his shots like a golfer. He usually gets ten out of ten shots on target, and with nine out of ten he hits the corners. If he is doing that deliberately, his accuracy is quite amazing." "It wasn't just the goals. He knew when and where to put the ball away, and run into space. He had such a lovely touch on the ball." 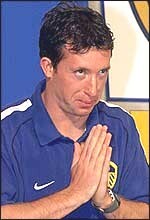 Liverpool scout, Jimmy Aspinall, saw 11-year-old Robbie Fowler score three goals in a match for Liverpool schoolboys. "After the Fulham game, I went round the chippy with my mates and got a big kiss from my mum when I got home!" "People were coming up to my family and saying: We've seen him [taking drugs]. I've got three kids now and I can honestly swear on my kids' lives that I've never even taken anything in my life." We were in high spirits after victory and enjoying a celebration drink on the plane home when Steve Harkness thought it would be a good idea to relieve himself in Robbie’s shoes as our young striker slept amidst the mayhem. When Robbie woke up, by which time I was fast asleep, he put his feet back in his shoes and quickly realised what had happened. Understandably, he wasn’t too pleased and when he demanded to know who’d done it, the lads pointed to me. As a result, he went into my bag and pulled out my new pair of £300 Gucci boots and proceeded to cut them up, thinking he’d got his revenge on the dirty culprit who’d pissed in his shoes. Bad move. When I woke up as we came in to the land, the lads were still in hysterics and it didn’t take a genius to work out why. It wasn’t until we were going through the airport I confronted Robbie, told him that I’d had nothing to do with the original stunt and demanded that he bought me new pair of boots to replace the ones he’d ruined. There was a big argument, a bit of pushing and shoving and having had enough of his bravado; I decided to teach him a lesson by punching him on the nose. Some of the other lads stepped in and although it was all over in a flash, the reporters who’d travelled with us were on the case and the story made the papers the next day. We’ve been the best of mates ever since.